If you leave your brain ticking during this action romp then you’re heading for trouble. The story to this supernatural twaddle is completely unfathomable. Jackie Chan‘s talents are misused once again by Hollywood, but at least this is better than The Tuxedo, if only marginally. There are no surprises to the buddy formula in which Chan supplies the action and British stand-up Lee Evans provides his Norman Wisdom-style of pratfall comedy. 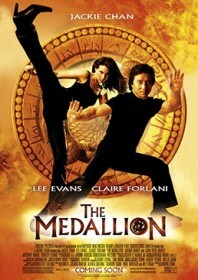 Flashy computer graphics take over when a kid possessing a special medallion (which is said to gift the wearer superhuman strength and immortality) is abducted by a psychotic Julian Sands who vows to unleash the amulet’s sacred powers. Jackie resorts to Jet Li-style wire fu towards the end of the film which is painfully trite, before all the supporting cast try out a bit of kung fu fighting. However, like the rest of the film, it’s an uncomfortable experience.